Since April 2018, the Italian State Guarantee Fund (Fondo di Garanzia), applies to some of the October Italian Projects. In case of default, the guarantee covers at least 40% of the outstanding amount of the loan. It offers some protection against the risk of the loan, helping SMEs access credit and decreasing the risk profile for lenders. What is the “Fondo di Garanzia”? The “Fondo di Garanzia” is a state guarantee set up by the Italian Ministry of Economic Development with the aim of helping SMEs access credit. It therefore reduces the investment risk for projects eligible to the guarantee. It is a potential mitigant for all October investors on loans to small and medium-sized enterprises. Which Italian companies are eligible to the guarantee? Not active in the following sectors: agriculture, forestry and finance. We will specify on the platform whether a project is eligible or not, so you can make your lending decision with the correct information. What percentage of each loan is covered by the guarantee? The guarantee will cover an amount equivalent to 80% of the part of the loan funded by institutional investors. Since the October fund always invests at least 51% of each project amount, the guarantee will cover a minimum of 40.8% (=80%*51%) of the total outstanding amount of the project. The actual amount covered by the guarantee will be known once the project is fully funded, when the percentage lent by private and institutional investors is known. For example, if the project is funded at 51% by the October Fund and 49% by private Lenders, the “Fondo di Garanzia” will cover 40.8% of the risk of the loan. If the project is funded at 25% by Private Lenders, the “Fondo di Garanzia” will cover 60% of the risk of the loan. If the project is 100% funded by the October Fund, the “Fondo di Garanzia” will cover 80% of the risk of the loan. Since it's not possible to know this percentage in advance, you should make conservative assumptions when you make your loan decision and assume that only 40% of the loan will be covered. Alignement of interest is one of the principles of October. This means that on all our projects, the amounts received from the loans are shared equally (“pari-passu”) between all the lenders according to the amount they have lent. This will also be the case for the amounts coming from the “Fondo di Garanzia”. Normally individual investors are not eligible for this guarantee, as it can be requested by financial institutions and institutional investors only. 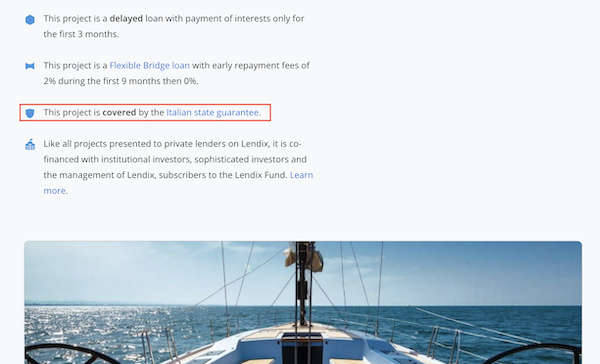 However, thanks to our unique mix of private and institutional lenders, October is the first Italian platform able to offer this kind of guarantee to individual lenders as well, regardless of their country of origin. How is October able to cover individual Lenders? Being in charge of managing the recovery process, October shares any recovered amount to all October Lenders, “pari-passu”, proportionately to how much each of them has lent to the project. When is the guarantee activated? In case of borrower default, October will act as an agent of the lenders to activate the guarantee. From the first eventual late payment, if October estimates the chances of recovery from the borrower as lower than the coverage of the guarantee, we will have the right to activate it. October will collect the amount guaranteed on behalf of the Fund. As mentioned before, the guaranteed amount will be shared «pari passu» with all Lenders (Fund and Individuals). It is free for the Lenders as it will be paid by the borrower. What is the impact on the lenders' Portfolio? The guarantee reduces the risk of capital loss. What are the advantages on the borrower side? The guarantee reduces the risk profile of the loan, therefore allowing the borrower to obtain more favorable loan conditions. What does a guaranteed project looks like? To sum up, here is an example of what a guaranteed Italian project will look like in your Portfolio vs. a non-guaranteed Italian project. Project A is guaranteed by the Fondo di Garanzia. The outstanding capital is of 100 euros when the project goes into default. When the Guarantee is activated, we will be able to recover at least 40% of the outstanding (40€). So the maximum capital loss possible is 60% of the outstanding (60€). Project B is not guaranteed by the Fondo di Garanzia. The outstanding capital is of 100 euros when the project goes into default. If our recovery Team is not able to recover any payments, the maximum capital loss possible is 100% of the outstanding (100€). Conclusion: the actual risk of loosing 100% of the outstanding lowers to 60% in case the project is covered by Fondo di Garanzia. Little reminder: the best way to minimize your risk is to diversify your Portfolio. *expression used in business law which literally means "treated exactly under the same conditions".